What Are The Best Online Master's In K-12 Education Programs? What Else Can I Expect From an Online Master's in K-12 Education Program? K-12 teachers are responsible for shaping the minds of young students and equipping them with the knowledge and skills needed to succeed as adults. According to the Bureau of Labor Statistics (BLS), roughly 3.2 million K-12 teachers are currently employed in the United States. This number includes 1,565,300 kindergarten and elementary teachers, 630,300 middle school teachers, and 1,018,700 high school teachers. These professionals earn median annual salaries ranging from $55,490 to $58,030, depending on the grade level they teach, and growth job in this sector is projected to grow 7% to 8% between 2016 and 2026. A bachelor's degree is required for most K-12 teaching positions, and those who teach K-12 classes at public schools must earn a teaching certification in all 50 states and the District of Columbia. Some states require K-12 teachers to obtain a master's degree once they become certified. However, even when a master's isn't required, earning an advanced degree in K-12 education can help certified teachers boost their salaries and qualify for advancement opportunities. The curriculum of a master's in K-12 education often includes specialization options for students to concentrate their coursework in niche areas of their profession, such as special education, education administration, or curriculum development. On-site student-teaching practicum courses are routinely required, as well. Many students today choose to earn their master's in K-12 education online, rather than in a classroom. The best online master's in K-12 education programs prepare students for advanced teaching roles, and may lead to higher salaries and advancement opportunities. Learn more about what you can do with a master's in K-12 education online and what kind of career opportunities you can look forward to with this comprehensive guide. 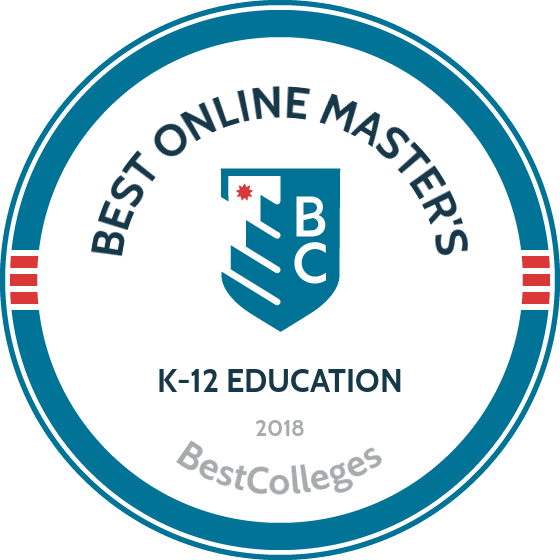 The best online master's in K-12 education programs build on the fundamentals of undergraduate studies while introducing new, more advanced approaches to classroom instruction, lesson planning, and educational technology. Many delve into psychological, behavioral, and social factors that affect the way children learn, communicate, and interact in classroom settings. Many master's pathways also prepare students for teaching certification requirements, including the certification exam and post-degree supervised teaching requirements. Program prerequisites vary by institution. Some pathways are designed for teachers that have already earned their state-level certification, while others prepare students to become certified once they have completed their master's degree requirements. In either case, a bachelor's degree in education or a related field from an accredited college or university will almost always be required ― and the bulk of today's bachelor's in education degree programs also include classroom-based practicum training courses. When choosing an online master's in K-12 education program, there are several factors to consider. These include the overall cost of the program (tuition and living expenses), student outcomes associated with the institution such as student retention and graduation rates, and the school's current accreditation status. Many students also choose certain K-12 education master's online tracks because they include specialization options that align with their career goals. WHAT ARE THE ADVANTAGES TO EARNING MY MASTER'S IN K-12 EDUCATION ONLINE? Online education offers a flexible alternative to traditional higher learning. Online degree programs often follow the same curriculum as their brick-and-mortar counterparts, and usually lead to the same job opportunities for successful graduates. The flexible format of web-based learning is also ideal for students with jobs, small children, and other commitments that make it difficult to commute to and from campus each day. It's important to note that most online K-12 education master's degree programs involve practicum coursework that must be completed onsite. UGA is a major academic center in Georgia, operating a main campus in Athens, extension campuses in four other cities, and a substantial online program. The school offers a Master of Education in middle grades education that focuses on teaching strategies for grades 4-8. Intended for both currently certified middle grades teachers and those with an interest in adolescent education, the program allows students to focus their degrees on language arts, social studies, and sciences. UGA's master's in teaching online offers rolling admissions and three start dates throughout the year. In order to earn their degree, students must complete 36 semester hours of coursework, a multicultural education survey, and an exit survey. Graduates are eligible to join the UGA chapter of the Association for Middle Level Education, the leading professional organization for adolescent educators. UGA offers other MEd programs relevant to K-12 teaching, including reading education and gifted and creative education. Texas A&M is one of the largest and most respected schools in the state, serving more than 60,000 students from its main campus in College Station. The school's Master of Education in curriculum and instruction emphasizes four core areas: academic learning, social climate and student emotional well being, school improvement, and family and community partnerships. Along with four foundational courses, students take eight education elective courses, with some flexibility to focus on specific academic interests. Students can also take up to two elective courses outside of the education department with faculty approval. While the program is offered fully online, classes differ in format and can include both synchronous and asynchronous material, ranging from video lectures and presentations to group projects and chat rooms. While A&M's online masters in education prepares students for K-12 teaching positions, the degree does not result in teacher certification. Taking just 18 months to complete, Clemson's master of education in teaching and learning includes 18 credit hours of pedagogical coursework and 12 hours of specialty coursework, allowing students to focus on specialty content areas including science, technology, engineering, art, and medicine (STEAM); early childhood education; and instructional coaching. The degree is organized around a cohort model that allows students to move through a complete course sequence together, with new cohorts beginning each summer. The program prepares graduates for a range of careers in education, including classroom teacher, curriculum specialist, department chair, and instructional coach. Students who pursue the STEAM track also receive a STEAM certificate upon graduation. In addition to its main campus in Columbia, USC also operates seven satellite locations along with a substantial online program, educating an additional 13,000 students around the state. Intended for certified teachers, USC's master's in education online prepares graduates to exercise effective teaching leadership at the student, school, and district levels, emphasizing skills of problem solving and education evaluation. For the first half of the degree, students take a series of five core courses focused on professional development, teaching issues, action research, and education research. Students have more leeway with the second half of the degree, working with a faculty adviser to select available courses that match their professional interests, including teaching, learning, assessment, and other related areas. Students pursuing their Master of Arts in education earn a versatile degree that's relevant to teachers, administrators, adult educators, school coaches, or anyone interested in a position in a K-12 school system. Offering a flexible curriculum that allows students to customize their course selection, the online master's in education features six concentration options: literacy education, K-12 school leadership, science and mathematics education, special education, sport leadership and coaching, and technology and learning. Students can choose to specialize in up to two concentration areas while also taking core courses focused on topics that include educational leadership, research, psychology. In order to earn their degree, graduates must complete 30 approved credits within five years of enrollment. Only online courses can fulfill degree requirements for the online MAEd. Students are assigned an advisor upon admission into the program. Founded in 1918, BU's School of Education emphasizes the connection between research and teacher training, focusing primarily on the areas of applied human development, language and literacy, and school improvement. The school's Master of Education in curriculum & teaching is designed for practicing teachers; students take only one course during each 14-week semester and complete the degree in around two years. Catering to working teachers' schedules, the course load is heavier during the summer months. Students earning their master's in teaching online can choose one of seven content tracks: elementary education, English, English as a second language, math, science, social studies, and special education. Online M.Ed. students are eligible to apply for financial assistance through the School of Education. This program does not lead to licensure endorsement, and acceptance into the degree depends on the students' states of residence. Founded in 1787 in Pittsburgh, Pennsylvania, Pitt is one of the oldest institutions of higher education in the country. Students earning their master's in education online have four degree options: elementary education, English and communication, mathematics education, and secondary social studies education. While the elementary and secondary social studies degrees are grade specific, the English and mathematics programs are content degrees, applicable to middle and high school teaching. Regardless of concentration, students take foundational courses covering pedagogy, the psychology of learning, and education and society, along with a selection of approved electives. While all degree tracks require 36 credit hours to complete, students who have earned teaching certification from Pitt can enroll in the elementary education track with advanced standing, completing their degree with only 18 hours of courses. All tracks offer rolling admissions, allowing students to choose one of three start dates throughout the year. Liberty is a private college affiliated with the Southern Baptist Conservatives of Virginia. The school proclaims itself the largest Christian university in the world, enrolling around 15,000 campus students and more than 100,000 online students from around the world. Liberty's online master's in education program offers a range of concentrations, including elementary education, English, education leadership, and special education. Combining Christian values with a firm grounding in educational theory, all of the degrees prepare graduates for teaching positions in public, private, and Christian schools. While many of the program tracks require a supervised practicum at an accredited school, some, such as education leadership, do not. With the exception of the teaching and learning, all concentrations require students to complete 3-4 intensives on-campus. Often referred to as "The People's University" for its emphasis on accessibility and social opportunity, MSU operates a main campus in Starkville, Mississippi. Students pursuing their Master of Arts in teaching online through MSU have two options: middle level education and special education. The middle level education degree prepares students to teach grades K-12, offering content specializations in areas including art, English, biology, physics, music, social studies, and math. The special education track prepares students for mild to moderate K-12 special education teaching. Both tracks offer initial licensure, allowing students to begin teaching while still pursuing the degree and earn full licensure upon completion. Both programs also require a supervised internship that can be performed locally. Due to internship requirements and state regulations, MSU currently can't admit online students who reside in the state of Georgia, though admission is open to residents of all other states. BSU was founded in 1918 in Muncie, Indiana, on land donated by American industrialists the Ball brothers. The school acknowledges its unique history through a commitment to entrepreneurial education, which emphasizes student learning through hands-on experience. Accordingly, education students at BSU participate in immersive learning experiences that stress professional practice and community engagement, even within the school's distance learning programs. BSU offers several options for students interested in an online master's in education, including elementary education, secondary education, special education, and math education. The curriculum and educational technology concentration is a unique track that focuses on the integration of new technology in K-12 education. All tracks are available fully online, except for special education which requires some campus courses for specialization in deaf education, early childhood special education, and mild interventions. All the degrees offer certification and licensure options and typically take 2-3 years to complete. A public research university with an enrollment of over 28,000, ECU ranks as the third-largest school in North Carolina, and its 1,400-acre Greenville campus encompasses five properties, nine colleges, and four schools. ECU was founded in 1907 as a teacher's college, and the school still maintains a focus on education, boasting some of the strongest online education programs in the country. Graduate students at ECU can choose from several master's in education online programs, including content area degrees in art, health, instructional technology, reading, elementary, middle grades, and special education. The programs are intended for working teachers, offering rolling admissions and 4-5 start dates throughout the school year. Most degrees include thesis and non-thesis options that must be completed along with a final portfolio and professional presentation requirement. All of ECU's K-12 education degrees require a North Carolina teaching license for admission. The largest college in southern Georgia, GSU was founded in 1906 and currently enrolls more than 20,000 students annually. GSU's online master's in education offers several concentrations, including curriculum and instruction, educational leadership, middle grades education, special education, and reading education. The program is open only to teachers who hold professional certification, and the middle grades education degree requires students to possess certification in either language arts, math, reading, science, or social studies. Regardless of specialization, the curriculum features core courses in learning theories and educational research, along with a selection of electives and a classroom component students can perform at their current school of employment. Most programs require 36 credit hours to complete. The M.Ed. programs have rolling admissions with three start dates each year. Serving about 6,000 students, UC is a small religious college in Williamsburg, Kentucky, affiliated with the Southern Baptist Convention. Students at UC gain a liberal arts education in the Christian intellectual tradition, benefitting from smaller class sizes and an educational model rooted in a moral and ethical perspective. UC's Master of Arts in teaching online offers two specializations relevant to K-12 teaching: literacy specialist and teacher leader. The literacy specialist program covers reading and writing instruction at all grade levels, along with the design and evaluation of related curriculum, preparing graduates for positions as literacy teachers or literacy coaches and consultants. The teacher leader program enhances existing teaching skills and encourages students to master new techniques, emphasizing professional development, leadership skills, and best practices for teaching and mentoring. While neither of the programs leads to initial teacher licensure, they provide professional certification in Reading & Writing and Teacher as Leader, respectively. Though its main campus is based in Searcy, Arkansas, Harding is a global institution, maintaining satellite locations in Australia, Chile, England, Greece, Italy, France, and Zambia. An enrollment of 6,000 students makes Harding the largest private college in Arkansas, and around 40% of those students complete a study abroad program before graduation. For distance students, Harding offers several degree options for earning a master's in education online, including advanced studies in teaching and learning, curriculum and instruction, educational leadership, reading, and special education. Students can also pursue a Master of Arts in teaching and a Master of Science in education. Most programs at Harding are open to licensed teachers and require 35 credit hours to complete. Regardless of concentration, students take courses in instructional technology and Christian ethics in education, along with an introductory education course called Chalk and Wire that must be completed during the first semester. Since its founding in 1963, KSU has grown into a major research institution that attracts a global student body, representing 92 international countries. Students earning their master's in education online have several concentration options, including middle grades education, secondary education, special education, and teacher leadership. While the early childhood, middle grades, and secondary education degrees cover general education for specific grade ranges, the programs in educational leadership, instructional technology, and teacher leadership focus on specialized approaches to education. Both educational leadership and teacher leadership emphasize professional development and school improvement strategies, while instructional technology trains students to become technology specialists and educators in K-12 schools. Most tracks require 36 credit hours to complete, which are split between core courses and teaching field experience. Longview, Texas, is home to LeTourneau University, a private, interdenominational Christian college that enrolls around 2,700 students annually, with 48 different denominations represented. LeTourneau offers an online master's in education with a teaching and learning specialization, allowing students to earn their Texas teacher certification along with the degree. The program features three basic certifications: early childhood-6th grade, 4th-8th grade, or 7th-12th grade. Students can also increase their career options by adding an additional certification in either special education or English as a second language. In addition to advanced classroom teaching strategies, the curriculum includes certification prep classes and practice tests to help students prepare for professional certification exams. LeTourneau's online program uses a unique course format in which classes are offered one at a time, lasting from 3-7 weeks each. A private, Methodist liberal arts college in St. Paul, Minnesota, Hamline offers two options for students seeking an online master's in education: a Master of Arts in education and a Master of Arts in English as a second language with a K-12 licensure concentration. The education program helps students grow as teachers and classroom leaders, offering a personalized experience relevant to students' academic content specializations. While the degree is offered primarily online, some courses do require campus components. Hamline MAEd students who demonstrate outstanding academic performance and leadership achievements may be eligible for merit or leadership scholarship, and undergraduate alumni also receive a 10% tuition discount. The ESL program emphasizes language development and assessment, preparing graduates for subject teaching positions with English language learner students. Both programs offer rolling admissions and three annual start dates and typically tak3 18-24 months to complete. VGU is a major public institution in Richmond, Virginia, enrolling more than 31,000 students annually in 14 academic schools and colleges. The Master of Teaching program prepares students for initial teaching licensure in Virginia and offers concentrations in elementary education and several secondary education subject areas, including biology, earth science, and social studies. VGU also offers an extended teacher preparation program that allows students to earn their bachelor's and master's degrees simultaneously. Secondary education students must choose a bachelor's program that corresponds to a secondary subject area (such as English or biology), while elementary education students must earn a bachelor's in interdisciplinary studies. All program paths for the online master's in education require some supervised student teaching, and residents of Richmond or its surrounding areas can participate in the Richmond Teacher Residency Program, which connects grad students with skilled mentors in the Richmond public schools. Founded in 1858 in Baldwin City, Kansas, Baker is affiliated with the United Method Church and offers a comprehensive education that also integrates Christian faith and values. Baker's Master of Arts in education is a 36-credit-hour degree that offers four concentration options: technology, multicultural classrooms and student diversity, curriculum and instruction, and generalist. Each track includes 18 credit hours of core education courses and 18 hours of concentration electives; generalist students choose electives from any of the concentrations. Emphasizing student accessibility, the master of arts in teaching online offers year-round classes and rolling admissions, with new classes starting every seven weeks. While available fully online, Baker also offers a cohort program that allows distance students to connect with other students and faculty members through weekly meetings at local facilities. Students can also work with the school to establish a cohort within their own community. MSU's online master's in education programs offer concentrations in elementary education, literacy, and special education. The elementary education program allows students to customize their degree by dedicating one-third of courses to an area of their choosing, with options including reading, ESL, technology, social sciences, and individualized studies. Students in the reading track must already be certified in another area before entering the program, but graduates receive the Department of Elementary and Secondary Education Special Reading Teacher Certification for grades K-12. The special education program features an emphasis in blindness and low vision education that prepares graduates for work as itinerant, resource, or residential teachers to visually impaired students. All three programs are available entirely online and can be completed within 2-3 years. Located in the borough of California, Pennsylvania, Cal U is a public college and a member of the Pennsylvania State System of Higher Education. Cal U offers several master's in education online programs, including early childhood education, secondary education, English as a second language, STEM education, and technology education. The early childhood education, ESL, and technology education degrees all include certification and non-certification options. Online courses at CU are arranged in a cohort model, in which one group of students completes the degree course sequence together, working collaboratively. Courses are delivered in an asynchronous format that allows students to complete coursework on their own schedule. Most education programs at CU can be completed within five semesters of study, including summers. Established in 1884, NSU is one of the oldest colleges in Louisiana and boasts a huge selection of degree programs for students seeking either a master's in teaching or a master's in education online. The school's Master of Arts in teaching programs are grade-based, with options for early childhood education, elementary education, middle school education, and secondary education, along with special education paths for each level. The M.Ed. degrees encompass a range of programs, including curriculum and instruction, educational technology leadership, and special education. The curriculum and instruction degree offers concentrations in English education, reading, and professional teaching standards, while the special education degree includes concentrations in gifted education, early intervention, and grade-specific concentrations for elementary and middle school. Most programs require 36-39 credit hours of coursework for graduation. Occupying a sprawling 1,452-acre campus in the town of Warrensburg, Missouri, UCM is home to more than 14,000 students, with around 88% hailing from Missouri. Though it's firmly a regional college, UCM has made strides in distance education, including three online masters in education degrees: education and curriculum instruction, elementary education, and teaching. While the elementary education degree concentrates on grades K-6, the curriculum instruction degree offers options for K-12, middle level, and secondary education. The teaching degree offers options for secondary and middle school education -- which includes subject area certifications -- and educational theory, which focuses on the history and philosophy of education in the United States. All three degrees require 30 credit hours for completion and are available entirely online, though some elective courses may not be offered. WKU serves more than 20,000 students through its main campus, three regional locations, and a range of online programs. The school offers several degree options for students earning their Master of Arts in teaching online, including general programs in early childhood, elementary, middle grades, and secondary education, along with specialized degrees in gifted education, special education, literacy education, and biology education for secondary teachers. Typically requiring 30-36 credit hours for graduation, WKU's degree options feature primarily online courses, though most require a supervised education practicum. Many of the programs offer a cohort model that can include some face-to-face meetings with classmates and faculty members; these meetings can vary depending on student location and availability. WKU's education programs all require teacher certification for admission. Founded 1873, the college currently serves more than 12,000 students, representing most states and more than 50 countries. For students earning an online master's in education, SEMO offers four degree choices: elementary education, exceptional child education, secondary education, and teaching English to speakers of other languages. Students in the elementary education program have the option to specialize in reading, math/science, or early childhood education, while those in the exceptional child education program can choose from specializations in autism, mild/moderate cross-categorical, or early childhood special education. The secondary education degree also offers options in educational technology and educational studies. While the elementary and exceptional child programs offer fully online courses, the secondary education and teaching English programs may require some campus courses depending on availability and area of interest. All K-12 teachers who lead public school classrooms must be certified in the state where they work. Certification requirements include a set number of post-degree training hours, a background check, and successful completion of a certifying exam. Certification requirements vary state. Specific criteria for kindergarten and elementary teachers, middle school teachers, and high school teachers is available online through the BLS. Although a bachelor's degree can help you obtain entry-level teaching positions at the K-12 level, the employment rates are much more favorable for teachers who receive a master's. A recent report from Georgetown University's Center on Education and the Workforce (CEW) found that professional educators with a graduate degree faced a 2.2% unemployment rate. By comparison, the unemployment rate for teachers with a bachelor's degree and some professional experience is 3.7%, and 5.1% for recent graduates without experience. According to the Georgetown report cited above, students who obtain a master's in education earn median annual salaries of $49,000 immediately following graduation and $62,000 after they have been in the field for a few years. However, salary expectations for K-12 master's degree-holder will vary by specific job title. Using data from PayScale, the table below features salary estimates for five of the most popular career pathways among K-12 master's recipients. Most students who earn an online master's in K-12 education degree go on to pursue careers in public or private educational settings. In addition to classroom teaching roles, these degree-holders may pursue careers as principals and assistant principals, education administrators, special education teachers, or instructional coordinators. Five popular career paths for those with a master's in K-12 education are outlined below. Kindergarten and elementary teachers lead students between the ages of 5 and 10 to 12, depending on how their district divides grade levels. They specialize in leading lessons focused on rudimentary reading, writing, math, and science skills. They also incorporate art, music, drama, and other creative elements into their instruction. According to the BLS, 85% of kindergarten and elementary teachers work for public schools. Middle school teachers typically lead students between sixth and ninth grade. Unlike kindergarten and elementary teachers, who must be proficient in a wide range of subjects, most middle school teachers specialize in one area of study, such as English, history, math, science, technology, physical education, music, or art. When not teaching students, middle school educators are expected to plan their lessons. High school teachers are similar to middle school teachers, in that they usually specialize in an individual subject. They lead classes for students between the ages of ninth and twelfth grade. In addition to classroom instruction, they must provide guidance for students as they prepare to attend college or obtain jobs after graduation. Instructional coordinators develop, implement, and evaluate the curriculum taught to students at public and private schools. They design classes and lesson plans using student data, and may lead training workshops for current teachers. A master's degree is considered the minimum educational attainment level for this occupation. Gaining membership with a professional organization can be quite beneficial for students earning an online master's degree in K-12 education, as well as recent graduates. These organizations typically offer a host of resources, including certification and professional development opportunities, access to online journals and educational materials, invitations to conferences and networking events, and career counseling services for job-seekers. Three of the most prominent professional organizations for K-12 educators are outlined below. One of the largest professional organization for educators in the U.S., the NEA represents more than 3 million members in over 14,000 communities nationwide. The association is home to seven print and online publications, and membership discounts are offered to uncertified employees, retired professionals, and students. Established in 1994, the AAE is a nonprofit organization that currently represents members in all 50 states. The association offers a wide range of benefits for educators, including liability insurance, scholarships, and grants, and tuition discounts are available at AAE partner schools for students seeking a master's degree in education. Founded in 1916, this international organization represents principals, assistant principals, and other administrative personnel in 35 different countries. Membership benefits include life insurance, liability coverage, access to exclusive publications, and the opportunity to become a school advocate. Due to the relatively high cost of college tuition, a master's degree in K-12 education online represents a significant financial investment for most students. Many mitigate the cost of their education by applying for financial aid. The federal government offers a wide range of fixed-interest loans and grants for graduate students, which may be merit- and/or need-based. In order to qualify for federal aid, candidates must complete and submit a Free Application for Federal Student Aid (FAFSA). Additionally, students can receive financial aid through the school they attend, private companies, nonprofit organizations, and religious groups.